Open Enrollment for 2018 begins on Thursday! This is your chance to change your insurance benefits for the next calendar year. Benefits are an important part of your compensation package, so please take time to review these materials as you prepare to make your elections. 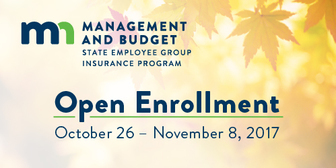 Check out the 2018 Open Enrollment tab on the SEGIP website. Open Enrollment dates: October 26 - November 8, 2017. Open Enrollment brochure: It has all the basic Open Enrollment facts. We also mailed a copy to your home. Enrollment instructions: Step-by-step instruction and pointers. 2018 Clinic Directory and Rate Guide. 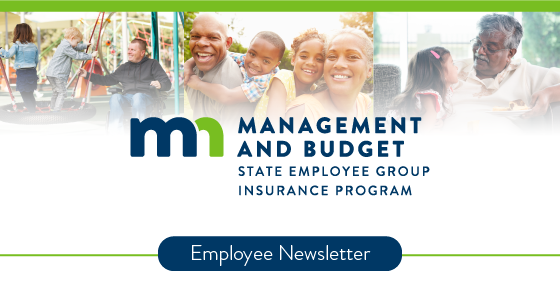 Want the latest benefits info? Receive text message updates by texting “mn segip” to 468311. Medical. You can change your carrier and add or drop coverage. Contact your carrier if you want to change primary care clinic (PCC). Dental. Dental benefits remain the same as in 2017. The Minnesota Legislature's Subcommittee on Employee Relations did not approve the state employee labor agreements on Oct. 5, 2017. That means we cannot offer the new and enhanced dental benefits for 2018, and the current 2017 dental benefits will remain in effect for 2018. Pre-tax spending account. Unlike all other benefits, pre-tax accounts do not continue from year-to-year. You must make a new election each year. Short Term Disability. It’s available during an Open Enrollment for the first time this century. You can enroll even if you have been turned down in the past. Long Term Disability. You may enroll or increase your coverage amount. Manager’s Income Protection Plan. Reduce the elimination period by 30 days. Life Insurance. You can add or increase Employee, Spouse, and Child Life insurance, within the specified amounts, without evidence of good health. All enrollees: CVS Caremark, HealthPartners, Blue Cross Blue Shield of Minnesota, Delta Dental, and HealthPartners Dental. Newly enrolled members, and existing members who changed their clinic or cost level: PreferredOne. Take the StayWell health assessment. 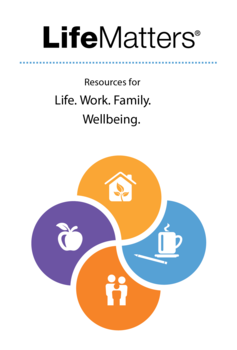 You will have access to activities and resources to improve your wellbeing whether you want to ramp up your activity level, dial down your stress, or work on a personal health goal. Get started with the Daily Dash: Participate in five-minute, mini challenges to help build healthy habits to move more, eat well, stress less, and sleep tight. With small, attainable goals, you can dash your way to improved wellbeing. Achieve your goals with Self-Directed Coaching: StayWell’s online, do-it-yourself coaching program helps you set a health goal, identify the challenges you’ll face, and figure out how to overcome the hurdles. Talk to an expert health coach: With the support of your coach, you’ll develop an action plan tailored specifically to you. You can talk with a coach by phone as often as you need. Typically, people connect with their coach about once a month for 15 minutes. Personalize your experience: Make the StayWell portal your own. It allows you a variety of functions from syncing your wearable device to personalizing your homepage layout. 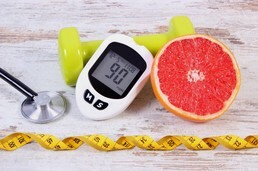 Visit segip.staywell.com to complete your health assessment and to discover these additional benefits. CVS Caremark will be SEGIP’s new Pharmacy Benefit Manager (PBM), beginning January 1, 2018. You do not need to take any action during Open Enrollment. CVS Caremark will automatically manage prescriptions for all Minnesota Advantage Plan members. CVS Caremark will mail you a Welcome Packet by the end of 2017 that provides important information. It will also include your new prescription card. By January 1, 2018, the pharmacy network and the drug formulary, as well as other resources, will be available on the CVS Caremark website. Questions? Call CVS Caremark customer service at 1-844-345-3234. You can use it at any eligible provider who accepts VISA. Your name, State of Minnesota, and the 121 Benefits logo will appear on the card. o You are a new enrollee in the Medical/Dental Expense Account (MDEA), Health Reimbursement Account (HRA), or Bus Pass/Van Pool Expense Account (BVEA). o Your existing Benny card expires on December 31, 2017. Otherwise, you will receive the new card in the year your Benny card expires. The new debit card will work just like the Benny card. The same IRS substantiation requirements will apply – so save your receipts. Your new debit card will arrive in your mailbox in a plain white envelope. Keep an eye out for it. Replacements cost $10. Debit cards make it easy to access your MDEA, HRA, and BVEA dollars. You can use it to pay for eligible expenses directly from your pre-tax account, eliminating the wait for reimbursement. Pay for bus or light rail fares through your BVEA? Only plastic will work. Only pay for your bus passes and light rail purchases with your 121 Benefits-provided pre-tax debit card. If you pay another way, you won’t be reimbursed with your BVEA dollars. 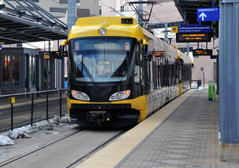 You can only purchase bus and light rail fares from transit stations, transit service centers, transit providers’ websites, or transit mobile app. You won’t be reimbursed if you purchase these items from grocery or convenience stores. This change does not apply to vanpool expenses. More information is available on the 121 Benefits website. Check your primary care clinic’s cost level during Open Enrollment. Your primary care clinic may change cost levels each year. Your clinic’s cost level determines your out-of-pocket costs for the year. Check to see if your primary care clinic is offered at a lower cost level by any of the three carriers (BlueCross BlueShield, HealthPartners, or PreferredOne). If so, you can elect to change your carrier during Open Enrollment. Consider changing your primary care clinic. To change your primary care clinic, but not your carrier, call your carrier directly – even during Open Enrollment. 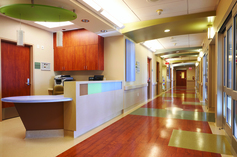 Primary care clinic changes are effective the first of the month following the request date. You can find your carrier’s phone number on your medical ID card. We are rolling out a new pilot program for Minnesota Advantage Health Plan members age 18 and older who are diagnosed with Type I or Type II diabetes. Beginning on January 1, 2018, this enhanced benefit will help you manage your diabetes while also saving you money. Advantage Value reduces out-of-pocket costs (copays and coinsurance) for certain high-value medical services related to diabetes, as well as for certain diabetes-related prescription drugs and testing supplies. High-value services reduce the progression of diabetes and the risk of costly complications. Eligible members do not need to enroll. Benefits will automatically be applied to eligible services, prescription drugs, and supplies through your health plan or CVS Caremark (SEGIP’s new pharmacy benefit manager in 2018). All members currently enrolled in a Diabetes Medication Therapy Management (MTM) program will automatically be transitioned into this new pilot program. For more information about Advantage Value for Diabetes, please visit the SEGIP website. LifeMatters EAP has been expanded from 3 to a possible 5 sessions of in-person consultation per matter. Call LifeMatters EAP any time, any day at 800-657-3719, or connect with services online at mylifematters.com (password STMN1). November 8 only: 7 a.m. to 7:30 p.m.
Mon – Thurs: 8 a.m. to 8 p.m.
Fri: 8 a.m. to 6 p.m.
See our How to Enroll instructions for assistance. Locked out of Self Service? The password resets three times within every 24-hours. On the last day of Open Enrollment, it resets every hour.